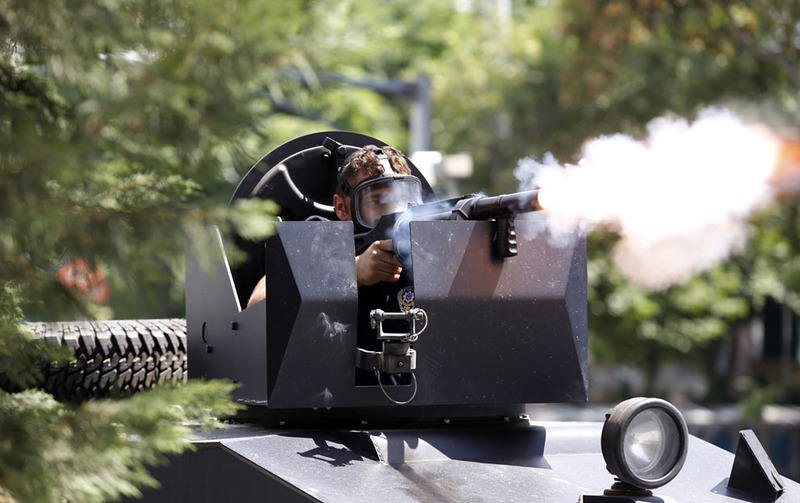 Crowd control actions executed by Turkish police in 2013 have showcased the employment of several less-lethal launchers. Aside from a range of medium-calibre riot guns (including 37/38mm Federal Riot Guns, 37/38mm Penn Arms PL-8 rotary launchers, and MKE 40mm launchers) firing CS, impact, and possibly OC munitions, three other less-lethal launchers have been observed. Each of these launchers offer the ability to fire multiple projectiles quickly, and have a capacity which exceeds that of typically-employed 12 gauge and 37/38mm & 40mm systems. 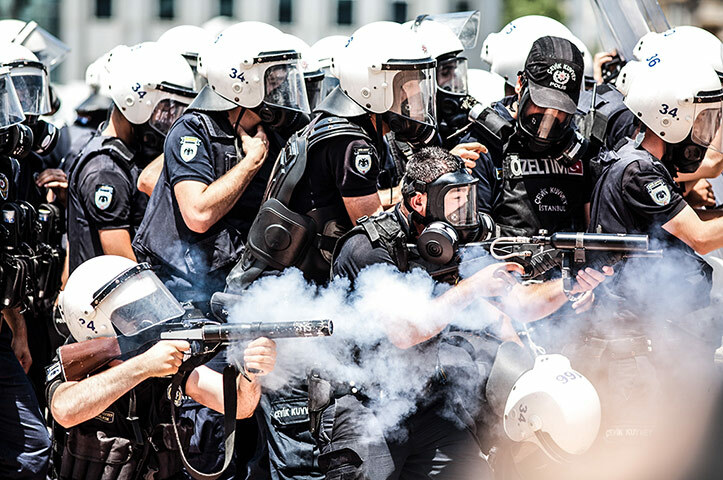 Both of these weapons appear to be in use with the Çevik Kuvvet anti-riot police unit. There has been confusion about what these systems are, where they are produced, and what their capabilities are. The first is the Fabrique Nationale d’Herstal (FNH) FN 303, seen at right in the image above. This purpose-designed, semi-automatic weapon uses compressed air to propel projectiles out to one hundred metres or so. It functions primarily as an impact weapon, though several of the available (FN-proprietary) projectiles have secondary effects, as described below. The weapon is constructed primarily of polymer, and is reasonably lightweight at 2.2kg. There is a Picatinny rail along the top of the receiver, and folding front and rear iron sights. An EOTech holographic sight, specifically calibrated to match the FN 303′s ballistic profile, is also available. The FN 303 is fed from a 15-round detachable drum magazine, which features a clear polymer back plate to allow for rapid identification of round count and type. Magazine changes can be accomplished in a few seconds, and magazines can be reloaded in around 30 seconds. The weapon is factory-set to a muzzle velocity of 86-91 metres per second. Compressed air canisters are factory-specified, and the users’ manual warns against using other containers. One full tank should be good for around 100 shots. FN 303 ammunition has also been documented in Turkey; the projectile pictured above is an 18mm (.68 calibre) glycol-based impact munition for the FN303. Other available projectiles include powder-based impact, impact + indelible marker paint, impact + washable marker paint, and impact + irritant powder. The munitions all contain a bismuth payload to provide weight for impact, and are fin-stabilised to provide accuracy at longer ranges than many other less-lethal launchers. All have the primary effect of incapacitating the target or degrading his or her will to fight through force of impact. Marker rounds have the secondary effect of assisting authorities in identifying potentially threatening individuals. The irritant projectile contains a synthetic capsaicin known as PAVA (for pelargonic acid vanillylamide; also known as nonivamide) which delivers a disruptive or incapacitating effect. At close range, these projectiles have been known to penetrate sheetrock, hollow-core doors, and auto glass and still affect the target behind cover. FN Herstal give the range for point targets as 50m, but the weapon can be effective out to 100m against area targets, such as crowds. FNH USA gives the minimum engagement range as 1m, however US DoD policy forbids engagement at ranges less than 5m. As with other impact munitions such as rubber bullets or 37/40mm impact projectiles, it is essential to engage targets in the limbs or torso to avoid serious injury. The FN 303 manual warns “Death or serious injury may result from projectiles striking the head or neck.” It is important to remember that there are risks inherent to the use of all less-lethal systems; this is precisely why there is a trend towards the use of the term ‘less-lethal’ rather than ‘non-lethal’. Comparatively safe systems, such as the FN 303, are often a preferable alternative to the use of live rounds or other, more dangerous less-lethal solutions. 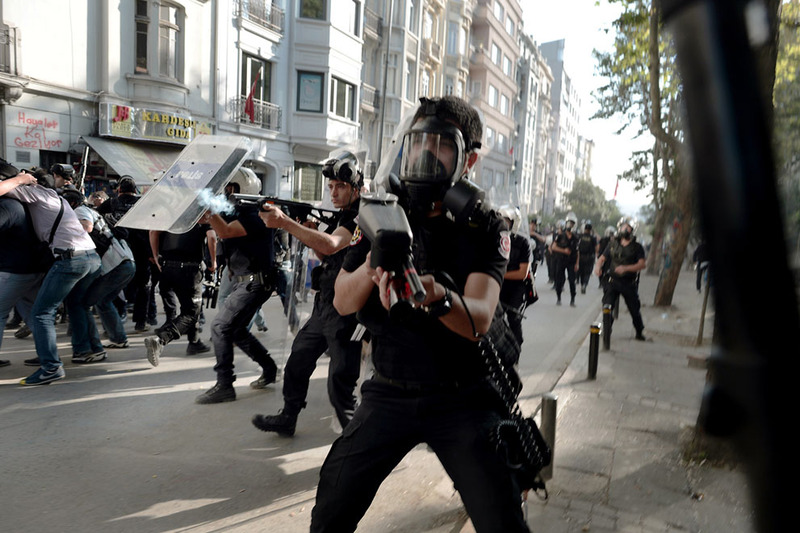 It appears that the Turkish police tested the FN 303 in 2008, and introduced it in into service in 2010. This article suggests the use of both washable (pink) and indelible (yellow) marker projectiles. Damien Spleeters has more on the presence of FN 303 launchers in Turkey at his excellent site. The FN 303, in particular, seems to be the cause of frequent confusion when it comes to identification. In one particularly egregious example, an FN 303 seen in Libya was described as an ‘American submachine gun’. The other two systems sighted are the TAC 700 riot gun, produced by PepperBall, and the Tippmann LE-900. Both of these are essentially repurposed paintball guns, operating in a similar fashion and firing a similar projectile. Unlike the FN 303, the TAC 700 and LE-900 air cartridges can be refilled without the need for special equipment. They are selective fire weapons, capable of semi-automatic fire, three-round burst, and fully automatic fire at rates of up to 700 and 900 rounds per minute, respectively. PepperBall describe the TAC 700 as target accurate out to 60 feet (approximately 18m), or for area saturation out to 150 feet (48m). Both systems are chambered for .68 calibre paintball-type projectiles. Tippmann, a well-known manufacturer of paintball markers, ammunition, and equipment, produce a range of .68 calibre markers. It should be noted that PepperBall-branded systems are also based on Tippmann paintball markers. A wide range of projectiles are available for the systems. PepperBall lists several of their branded projectiles on their website, including inert, marking, water filled, and glass-breaking (solid nylon) varieties. 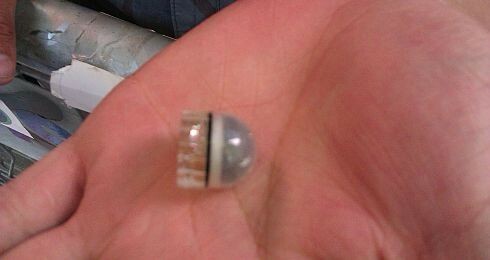 Additionally, there are the eponymous ‘PepperBall’ projectiles, available in ‘Live’ and ‘Live X’ formulae. The Live projectiles are filled with Capsaicin II, whilst the Live X range contain PAVA, described by PepperBall as “10x hotter than Live projectiles”. Numerous other .68 calibre paintballs are available from other retailers, including a variety of ‘pepper’, ‘chili’, and PAVA-filled examples. One South African website lists its solid nylon projectiles as ‘Skull Breakers’. Images copyright (top-bottom): AFP, Zuma Press, bianet, The Atlantic. My thanks to MP.net member ‘Ulytau’ for pointing out the Çevik Kuvvet unit. This post originally appeared at The Rogue Adventurer.